نایب پاشایی, نسیم, راسخ صالح, نیما, افکار, امیر, نوری کمری, مجید, هادوی, سید محمد مهدی. (1397). تحلیل ترمومکانیکی اثر افزودن آلومینا به سیستم پوشش سد حرارتی ایجاد شده به روش پاشش پلاسمایی از طریق شبیه‌سازی المان محدودنسیم. نشریه علوم و مهندسی سطح, 14(38), 19-41. نسیم نایب پاشایی; نیما راسخ صالح; امیر افکار; مجید نوری کمری; سید محمد مهدی هادوی. "تحلیل ترمومکانیکی اثر افزودن آلومینا به سیستم پوشش سد حرارتی ایجاد شده به روش پاشش پلاسمایی از طریق شبیه‌سازی المان محدودنسیم". نشریه علوم و مهندسی سطح, 14, 38, 1397, 19-41. نایب پاشایی, نسیم, راسخ صالح, نیما, افکار, امیر, نوری کمری, مجید, هادوی, سید محمد مهدی. (1397). 'تحلیل ترمومکانیکی اثر افزودن آلومینا به سیستم پوشش سد حرارتی ایجاد شده به روش پاشش پلاسمایی از طریق شبیه‌سازی المان محدودنسیم', نشریه علوم و مهندسی سطح, 14(38), pp. 19-41. نایب پاشایی, نسیم, راسخ صالح, نیما, افکار, امیر, نوری کمری, مجید, هادوی, سید محمد مهدی. تحلیل ترمومکانیکی اثر افزودن آلومینا به سیستم پوشش سد حرارتی ایجاد شده به روش پاشش پلاسمایی از طریق شبیه‌سازی المان محدودنسیم. 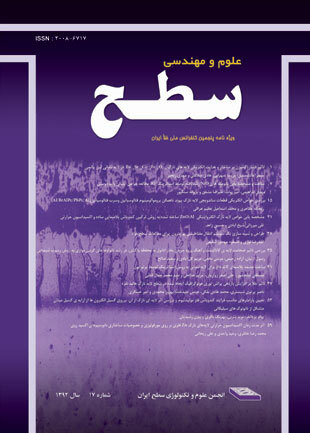 نشریه علوم و مهندسی سطح, 1397; 14(38): 19-41. در این مطالعه مجموعه­ای از حالات محتمل افزودن آلومینا به سیستم پوشش سد حرارتی با در نظر گرفتن نتایج تجربی گزارش شده توسط سایر محققین از نقطه نظر حالات بهینه افزودن آلومینا به سیستم پوشش سد حرارتی از جنبه افزایش مقاومت به اکسیداسیون و خوردگی داغ در نظر گرفته شده و انتقال حرارت و توزیع تنش در آن‌ها بصورت مقایسه­ای و مطلق مورد بحث و مطالعه قرار گرفته است. نتایج نشان داد که در نمونه­های حاوی آلومینا منطقه بحرانی تمرکز تنش در فصل مشترک لایه حاوی آلومینا با لایه­های مجاور رخ می­دهد. همچنین همواره مقادیر تنش ماکزیمم در نمونه­های حاوی آلومینا نسبت به نمونه­های فاقد آلومینا بالاتر است. با توجه به ضریب هدایت حرارتی بالاتر آلومینا نسبت به YSZ، افزودن آلومینا به سیستم پوشش سد حرارتی خاصیت عایق سازی حرارتی را تضعیف می­کند. 1. Hetmańczyk, M., Swadźba, L., & Mendala, B., Advanced materials and protective coatings in aero-engines application., Journal of Achievements in Materials and Manufacturing Engineering, 24(1) (2007) 372-381. 2. Tamarin, Y., Protective coatings for turbine blades. ASM international, (2002). 3. Baig, M. N., Khalid, F. A., Khan, F. N., & Rehman, K. Properties and residual stress distribution of plasma sprayed magnesia stabilized zirconia thermal barrier coatings. Ceramics International, 40(3) (2014) 4853-4868. 4. Guo, L., Li, M., He, S., Zhang, C., Wang, Q., & Ye, F. Preparation and hot corrosion behavior of plasma sprayed nanostructured Gd 2 Zr 2 O 7-LaPO 4 thermal barrier coatings. Journal of Alloys and Compounds, 698 (2017) 13-19. 5. Wang, L., Li, D. C., Yang, J. S., Shao, F., Zhong, X. H., Zhao, H. Y., ... & Wang, Y. Modeling of thermal properties and failure of thermal barrier coatings with the use of finite element methods: A review. Journal of the European Ceramic Society, 36(6) (2016) 1313-1331. 6. Goswami, B., Ray, A. K., & Sahay, S. K. Thermal barrier coating system for gas turbine application-A review. High Temperature materials and processes, 23(2) (2004) 73-92. 7. Clarke, D. R., & Phillpot, S. R. Thermal barrier coating materials. Materials Today, 8(6) (2005) 22-29. 8. Karaoglanli, A. C., Altuncu, E., Ozdemir, I., Turk, A., & Ustel, F. Structure and durability evaluation of YSZ+ Al2O3 composite TBCs with APS and HVOF bond coats under thermal cycling conditions. Surface and Coatings Technology, 205 (2011) S369-S373. 9. Chen, W. R., Archer, R., Huang, X., & Marple, B. R. TGO growth and crack propagation in a thermal barrier coating. Journal of Thermal Spray Technology, 17(5-6) (2008) 858-864. 10. A.M. Khoddami, A. Sabour, S.M.M. Hadavi, Microstructure formation in thermally-sprayed duplex and functionally graded NiCrAlY/Yttria-Stabilized Zirconia coatings, Surface & Coatings Technology, 201 (2007) 6019–6024. 11. زرگر حمیدرضا، سرپولکی حسین و ح. رضایی حمیدرضا، آشنایی با پوشش­های سرامیکی محافظ حرارت و روش‌های اعمال، فصلنامه سرامیک ایران، 6-5 (1385) 59-45. 12. ح. جمالی، ر. مظفری نیا، ر. شجاع رضوی و ر. احمدی پیدانی، ارزیابی ظرفیت عایق سازی حرارتی پوشش‌های سد حرارتی پایه زیرکنیایی پاشش پلاسمایی شده، مجله علمی پژوهشی مهندسی سطح،14 (1391) 87-77. 13. K.A. Khor, Y.W.G., Thermal properties of plasma-sprayed functionally graded thermal barrier coatings. Thin Solid Films, 372) 2000(104-113. 14. Chen, H., Liu, Y., Gao, Y., Tao, S., & Luo, H., preparation, and characterization of graded YSZ/La2Zr2O7 thermal barrier coatings., Journal of the American Ceramic Society, 93(6) (2010)1732-1740. 15. Haynes International, I., https://www.haynesintl.com. HASTELLOY ® X ALLOY. (1997). 16. Wang, L., Wang, Y., Sun, X. G., He, J. Q., Pan, Z. Y., & Wang, C. H., Thermal shock behavior of 8YSZ and double-ceramic-layer La 2 Zr 2 O 7/8YSZ thermal barrier coatings fabricated by atmospheric plasma spraying. Ceramics International, 38(5) (2012)3595-3606. 17. Limarga, A. M., Widjaja, S., & Yip, T. H. Mechanical properties and oxidation resistance of plasma-sprayed multilayered Al 2 O 3/ZrO 2 thermal barrier coatings., Surface and Coatings Technology, 197(1) (2005) 93-102. 18. Reed, R. C., The superalloys: fundamentals and applications. Cambridge university press, (2008). 19. Rasheedat, M. M., Esther, T. A., Mukul, S., & Sisa, P., Functionally graded material: An overview. In Proceedings of the World Congress on Engineering, (2012). 20. Keyvani, A., Saremi, M., & Sohi, M. H. Microstructural stability of zirconia–alumina composite coatings during hot corrosion test at 1050° C., Journal of Alloys and Compounds, 506(1) (2010) 103-108. 21. Keyvani, A., Saremi, M., & Sohi, M. H. Oxidation resistance of YSZ-alumina composites compared to normal YSZ TBC coatings at 1100 C. Journal of alloys and compounds, 509(33) (2011) 8370-8377. 22. Saremi, M., Valefi, Z., & Abaeian, N., Hot corrosion, high temperature oxidation and thermal shock behavior of nanoagglomerated YSZ–Alumina composite coatings produced by plasma spray method., Surface and Coatings Technology, 221 (2013) 133-141. 23. Chen, Z., Wu, N. Q., Singh, J., & Mao, S. X., Effect of Al2 O3 overlay on hot-corrosion behavior of yttria-stabilized zirconia coating in molten sulfate-vanadate salt., Thin solid films, 443(1) (2003) 46-52. 24. Daroonparvar, M., Yajid, M. A. M., Yusof, N. M., Hussain, M. S., & Bakhsheshi-Rad, H. R., Formation of a dense and continuous Al2O3 layer in nano thermal barrier coating systems for the suppression of spinel growth on the Al2O3 oxide scale during oxidation., Journal of Alloys and Compounds, 571 (2013) 205-220. 25. Zhang, X. C., Xu, B. S., Wang, H. D., & Wu, Y. X., Effects of oxide thickness, Al2O3 interlayer and interface asperity on residual stresses in thermal barrier coatings., Materials & design, 27(10) (2006) 989-996. 26. Widjaja, S., Limarga, A. M., & Yip, T. H. Oxidation behavior of a plasma-sprayed functionally graded ZrO2/Al2 O3 thermal barrier coating., Materials Letters, 57(3) (2002) 628-634. 27. عرب سرهنگی سمانه، میرحبیبی علیرضا، عربی حسین، رستگاری سعید، بررسی خواص ریزساختاری و مکانیکی پوشش چند لایه سپرحرارتی کامپوزیتی زیرکونیا/ آلومینا و پوشش دولایه زیرکونیایی اعمال شده به روش پاشش پلاسما، فصلنامه سرامیک ایران،31 (1391)56-50. 28. Saremi, M., & Valefi, Z., Thermal and mechanical properties of nano-YSZ–Alumina functionally graded coatings deposited by nano-agglomerated powder plasma spraying., Ceramics International, 40(8) (2014) 13453-13459. 29. Bäker, M., Influence of material models on the stress state in thermal barrier coating simulations, Surface and Coatings Technology, 240, (2014) 301-310. 30. Chen, H., Liu, Y., Gao, Y., Tao, S., & Luo, H. Design, preparation, and characterization of graded YSZ/La2Zr2O7 thermal barrier coatings., Journal of the American Ceramic Society, 93(6) (2010) 1732-1740. 31. Haynes International, I., https://www.haynesintl.com. HASTELLOY ® X ALLOY. )1997(. 32. Wang, L., Wang, Y., Zhang, W. Q., Sun, X. G., He, J. Q., Pan, Z. Y., & Wang, C. H. Finite element simulation of stress distribution and development in 8YSZ and double-ceramic-layer La2Zr2O7/8YSZ thermal barrier coatings during thermal shock., Applied Surface Science, 258(8) (2012) 3540-3551. 33. Limarga, A. M., Widjaja, S., & Yip, T. H. Mechanical properties and oxidation resistance of plasma-sprayed multilayered Al 2 O 3/ZrO 2 thermal barrier coatings., Surface and Coatings Technology, 197(1) (2005) 93-102. 34. Widjaja, S., Limarga, A. M., & Yip, T. H. Modeling of residual stresses in a plasma-sprayed zirconia/alumina functionally graded-thermal barrier coating., Thin Solid Films, 434(1) (2003) 216-227. 35. Ranjbar-Far, M., Absi, J., Shahidi, S., & Mariaux, G. Impact of the non-homogenous temperature distribution and the coatings process modeling on the thermal barrier coatings system., Materials & Design, 32(2) (2011) 728-735.